The objective of the Conference was to examine the strides made over the last two decades in Science, Technology and Innovation (STI), to look at the role played by regional, extra regional and international organizations and at the same time to seek and to identify ways to strengthen cooperation so that STI can more effectively assist with the socio-economic development of our Caribbean people. Participants who attended this Conference were from both the University of the West Indies – St. Augustine, Trinidad and Mona Campus, Jamaica, The University of the Trinidad and Tobago (U.T.T. ), the National Institute of Higher Education, Research Science & Technology (NIHERST) and distinguished delegates from Barbados, Brazil, Canada, Cuba, El Salvador, Guyana, Jamaica, Panama, Suriname, the USA. 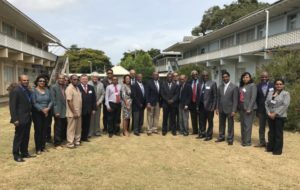 It was organized by The CARICOM Science, Technology and Innovation Committee (CSTIC), which is a group of science and technology (S&T) experts selected by the Rt. Honorable, Dr. Keith Mitchell, Prime Minister of Grenada and Prime Minister responsible for S&T in CARICOM from both within the region and the Diaspora, jointly with UNESCO affiliate, CARISCIENCE, The University of the West Indies (UWI), St. Augustine Campus, The University of Trinidad and Tobago (UTT), and The University of the Southern Caribbean (USC) with the support of the InterAcademy Partnership (IAP) during the period 3-4 May, 2017 at the St. Augustine Campus of the University of the West Indies in Trinidad. He described the Conference as “most timely” and added that the organization “must strategise, avoid duplication and embrace greater cooperation”. He hopes that this “deliberation would lead to a renewed effort to strengthen our S&T capacity, strengthen our research culture; thereby creating a better Caribbean society”. The conference continued over two (2) days with engaging conversations and discussions to chart a way forward for STI in the Caribbean and beyond. Trinidad and Tobago National Commission for UNESCO.